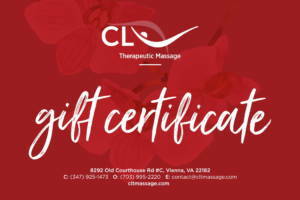 A gift certificate from CLT Massage is ALWAYS the perfect gift. When we’re open, visit us in-store. When we’re not, purchase AND print online right from home! We’ve made it easy to find, purchase, and deliver the worlds most wonderful gift. Click below to start shopping! *all gift certificates are non-refundable and must be presented in-store to redeem.